USA Shapes is the shirt of the week. $10.00 will buy you this awesome shirt with free shipping! Click on the image to the right and choose "pick up" and we will send it to you at no charge, via snail mail. I know it is kind of late, but if you order this shirt on Monday we might be able to get it to you by Thursday the 3rd. That way you can sport your new shirt on the 4th. How is that for a promise!!! USA Shapes is what we at RockSports call this patriotic design from V....Vaughan. 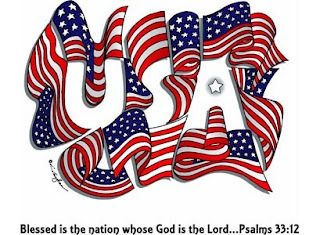 Blessed is the nation whose God is the Lord...Psalms 33:12 is written below the design on the shirt. The red, white, and blue design is printed on 100% cotton 6.1oz T-shirt. I was born on the 4th of July - almost. My Birthday is actually on the 5th of July, but we tend to always celebrate it on the 4th. Being born so close to the 4th is probably alot like being born near Christmas. There is the good and bad. I always have fireworks on my birthday and people always come together. What more could you ask for right? Growing up, I guess I got used to the Summer Festivities and a, I'll admit it - I was a little bit spoiled. On my 15th birthday I learned a valuable lesson on happiness. It was July 5th, 1995 and I was miserable. I thought my family or my friends were going to come over on the 4th and celebrate. When that didn't happen, and the 5th came and went without a big party, festivities, or presents, I was crushed. I know - I was a spoiled brat. On that day, skipping dinner with my family to sulk, I did some reflecting and realized that I have control of my attitude. I also remembered how important it is to take control, when you want something in particular. I vowed that on my birthday I would try to serve others, rather then waiting to be served. After a decade plus of more July 4ths and 5ths this promise has been a guarantee for a sense of self worth and happiness. This July 4th, as you are making your plans, remember to give back a little. Wake up with anticipation of the amazing impact that you can have on your family and friends. Let the inspiration of the fireworks remind you of the presence and impact that you can have in others lives and that your reward for serving others will be true joy. Do you fear the flute? - You should!